Political activists and even certain U.S. senators have argued that the federal government should reinstitute the Fairness Doctrine, which would require broadcasters to air both sides of controversial issues. Opponents charge that Fairness Doctrine advocates are trying to reduce the impact of conservative talk radio. Rep. Mike Pence (R-Ind.) has introduced The Broadcaster Freedom Act (HR 2905), which would bar the Federal Communications Commission from reinstating the Fairness Doctrine. The controversy touches on America's most fundamental civic values. Do we still cherish freedom of speech, or are some of us succumbing to the tyrannical impulse to stifle the speech of political adversaries? Do our leaders trust us to accept responsibility to govern ourselves, or do they wish to control which information we receive? Three principal arguments support resurrecting the Fairness Doctrine. First, the 'scarcity' argument holds that the airwaves are public property with a limited number of broadcast frequencies, so government can and should intervene if the public debate is out of balance. Second, the 'censorship' argument holds that major corporations are muzzling liberal opinion on the radio, so Americans are not hearing both sides of issues. Third, the 'public interest' argument holds that the Fairness Doctrine would increase the amount and variety of opinions available to the public. Are these arguments valid? They are myths. 1. The scarcity argument. Is conservative dominance of commercial talk radio distorting the national debate about public policy issues? Americans have never enjoyed so many professional sources of news and opinion. Americans can choose from a dozen or more daily network television news shows, 10 separate 24/7 cable news and public affairs channels, 1,400 daily newspapers, and more than 2,200 radio stations airing news/talk. The Internet has exponentially increased the availability of news sources. Thanks to the Internet, Americans are no longer limited to local media. Any St. Louis resident with a modem can read the Sacramento Bee and listen to political talk radio stations in Washington, D.C. The World Wide Web has pushed the number of daily news sources available well into the thousands for anybody with Internet access, and 70 percent or more of Americans are on line. Only 7 percent of American adults consider radio to be their main source for news and information. Fifty-five percent rely primarily on television news, a ratio of nearly 8 to 1. The Newspaper Association of America says 57 percent of American adults read a newspaper every day. 2. The censorship argument. Are Americans hearing both sides of debates about controversial public policy issues, or are liberal voices being shut out? Liberal voices are well represented in talk radio, and are available to anyone with a modem or an FM radio. Six of the top 25 commercial talk radio hosts are liberals. The commercial Air America network, created to spread liberal ideas, has 55 stations broadcasting over the air. Twenty-six of these stations also stream over the Internet, as do hundreds of public radio stations. Noncommercial public radio has more than 800 stations with a total weekly news/talk audience of 14 million. At least 850 of the 2,200 talk stations air mostly liberal programming. 3. The public interest argument. 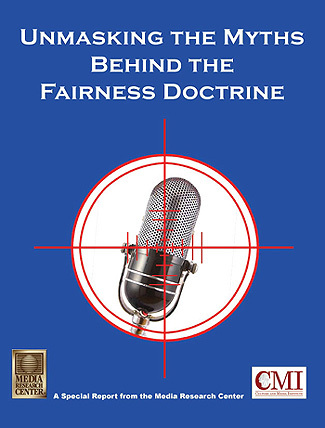 Would the Fairness Doctrine increase or reduce discussion about public policy issues? History says speech would be curtailed. When the Fairness Doctrine was in effect, talk radio avoided controversial topics. Most stations programmed only general talk and advice. Politicians repeatedly have used the Fairness Doctrine to chill speech. John F. Kennedy and Lyndon Johnson both used the Fairness Doctrine to stifle criticism, suppress the speech of political adversaries, and force radio stations to provide free air time. Efforts by liberal politicians to restore the Fairness Doctrine bring to mind the worst moment of Israel's King David. David was not satisfied with his many wives and concubines; he also had to have the beautiful Bathsheba, the only wife of one of his soldiers. American liberals already dominate four of the five most important news and information media, and they are determined to take over the fifth medium as well. America has so many sources of news and information available that no federal regulation of broadcasting content can possibly be justified on the grounds of public interest. The Fairness Doctrine has an ugly history of political abuse directly intended to restrict the free exchange of ideas. As liberals propose and agitate for a resumption of the Fairness Doctrine, history may repeat itself.